Come See Our Beautiful Campground ! 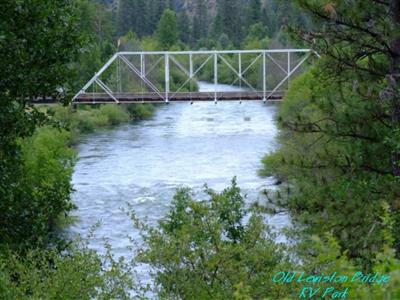 The Old Lewiston Bridge RV Resort is located in the small mining town of Lewiston, California in Trinity County. We are within walking distance of the old single lane bridge which spans the scenic Trinity River and the historic part of Lewiston. The picturesque surroundings are one our guests enjoy immensely. Wildlife flourishes in this area, deer graciously journey through the terrain on a regular basis, eagles soar above our forested mountains, ducks, blue heron and osprey are seen regularly. For the angular enthusiast, the Trinity River provides excellent fishing opportunities for steelhead, salmon and German browns. To name a few of the pleasures that visitors can enjoy - fishing, rafting, canoeing, swimming, bicycling, hiking, gold panning, golf in Weaverville, boat rentals on Lewiston and Trinity Lake, Moose lodge, hunting, guide service which includes floating river trips, walk-in and high mountain lake wilderness trips or simply sightseeing and shopping for arts, crafts and antiques in old Historic Lewiston. Welcome to our World Wide Web Visitors, be sure to look up more information on our park below. 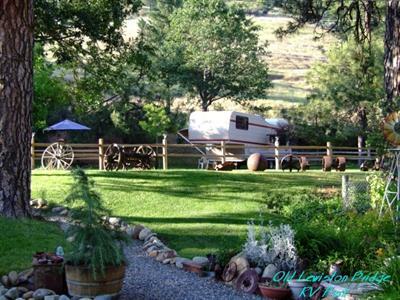 This Resort is nestled amongst the Trinity Alps in a rural yet majestic setting. It offers an opportunity to escape the stress and hectic life of the city. It is located within walking distance to the National Historic part of Lewiston and is highly rated by Good Sam. Lewiston is one of the most picturesque places to visit, one our guests never tire of. 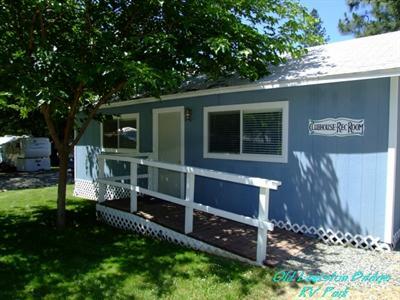 We are just 17 miles from the historic town of Weaverville, the county seat, and only 35 miles from Redding and I-5. The resort features 52 full-hookups with picnic tables on level, grassy sites and an abundant amount of shade. There are separate tent sites isolated amongst the trees on our lower level which has a bathhouse with hot showers. Look under Accommodations and Facilities to learn more about our park. Our NEW 500 square foot club is open, with a big screen TV and seating for up to 40 people.We also still have our 900 square foot pavilion (with a built in rock barbecue) was built with our guests in mind. It is there to use whenever you wish. Fishing the Trinity Rivers is an experience in itself. This beautiful river supports an abundance of wildlife and scenic forests. It is best known for its spring and fall funs of Chinook Salmon (Kings) as well as a smaller fall run of Coho Salmon (Silvers). The Trinity River has an excellent fall and winter fun of steelhead averaging 3 - 9 pounds and boasts of its large population of German Browns. The Trinity River offers all anglers a unique fishing experience, including a fly fishing only section just above the old bridge. Right off the park are some of the best fishing holes around. 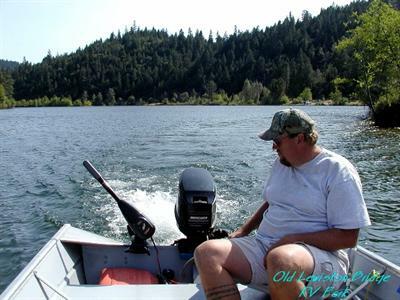 Only one and one half miles from us is the beautiful Lewiston Lake which supports a large population of Rainbow & Brown trout and Kokonee Salmon. Above Lewiston Lake is Trinity Lake which holds the state record for small mouth bass.